The South African Krugerrand is the official gold bullion coin of South Africa, which is the first gold bullion coin in the world minted for investment. The Krugerrand coins were marketed so successfully that they possessed an 89% market share of the entire gold bullion coin industry in the early 1980s. 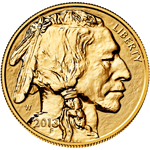 Nowadays, the Krugerrand is a popular coin among the investors and collectors. Composition : 91.67% Au, 8.33% Cu. Size Specification : 1 oz, 1/2 oz, 1/4 oz, 1/10 oz. Diameter : 32.77 mm, 27.07 mm, 20.06 mm, 16.55 mm. The South African Krugerrand was first introduced in 1967 minted by the South African Mint to offer private individuals an opportunity to own gold. During the 1970s with the great bull market in gold, the Krugerrand became the first selection for investors in the world. Between 1974 and 1985, an estimated 22 million gold Krugerrand coins were imported into the U.S. alone. During the 1970s and 1980s, the Krugerrand was suffered from the economic sanctions to prohibit South Africa from selling Krugerrand in the United States, however, that didn't affect the trading Krugerrand that were already in the U.S. The sanction was ended in 1994. In 1980, the South Africa introduced three smaller coins (1/2 oz, 1/4 oz, and 1/10 oz). 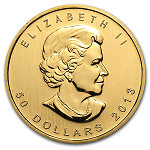 By 2008, the Krugerrand coins have been sold with 46 million ounces of gold. The obverse of the South Africa Krugerrand is the face of Boer statesman Paul Kruger, four-term president of the old South African Republic. The name of gold coin is a compound of "Kruger" (the man depicted on the obverse) and "rand", the South African unit of currency. 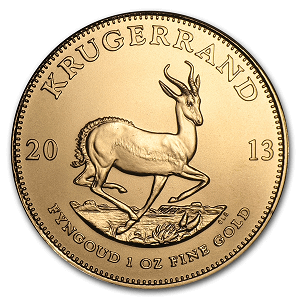 The reverse of Krugerrand is a springbok in the filed, one of the national symbols of the South Africa, which is designed by Coert Steynberg. This design was previously featured on the South African five shilling coin. The country name of "South Africa" and the gold content are inscribed in both Afrikaans and English on the gold coin. The Krugerrand is struck with no face value because it is primarily minted for trading outside South Africa. 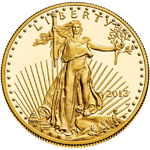 The market value of Krugerrand is changed based on the price of the world gold market. Each South African Krugerrand's price is the gold spot price of current market plus a premium per coin. 1. 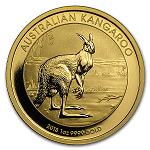 The South African Krugerrand is the first gold bullion coin in the world minted for investment. 2. The South African Krugerrand is with extremely high liquidity, it is convenient to buy and sell anywhere in the world where the precious metal are traded. 3. The South African Krugerrand is small and exquisite, so that easy to store, or transport. 4. The South African Krugerrand has a high level of recognition in Asia and Europe. 5. The South African Krugerrand is minted in 22 karat gold alloyed with 8.33% copper to make it stand up to the rigors of daily use. 6. The South African Krugerrand owns the classical design which is popular for collectors.